There are many social standards in this world, but it’s nearly un-American if you don’t have a dog. Having a dog to love and love you in return is one of the few innocent pleasures we still retain in this topsy-turvy world. It’s a joy I wouldn’t miss. Of course I grew up in a family that had it’s share of dogs. They were loved, spoiled, and returned the same a hundred-fold. Yet, after leaving home I wasn’t able to have a dog for many reasons. Newly married and renting, the landlords tend to frown on it and we didn’t acquire our handyman’s special for many years. And just when we thought we’d never have a dog, we did. Life is opportunistic that way. We already had our hands full with a house full of spitting felines and the baby was on the way. A set of sister pups was just what we needed to round out our chaos. Alas, one of the puppies died abruptly leaving her sibling alone in the great pen. The poor baby had also been christened “Sissy” for a myriad of reasons. The major one because I was still befuddled over a plethora of names for my coming child. Our evening romps were joyous. There was the farmer’s field on one side, and the neighbors’ to the back and side. My only real concern was the busy roadway in front of the house. This may be a rural area, but the traffic is heavy and quick. Yet, somehow, Sissy understood her boundaries and borders. I don’t know who coined the term “Dumb Dog,” but they aren’t. At least not mine. She knew that when I called to pen her up, she wasn’t coming. A cat will do the same for you. She would succumb to a treat because she knew it had to end sometime, and she enjoyed the security of the pen in the early years. Sissy discovered true ecstasy with Erin. She had a little person to own and protect. By the same token, Erin had someone mangle without much fear of retribution. Erin and Sissy are both hardy individuals that play hard, so the pokes, prods, and tail-pulls from both parties were just part of the play. Time passed and Sissy grew and endured the harsh weather outdoors. Her lovely doghouse was viewed only as a feeding place or a large chew toy. Sissy is a digger. She tunneled vast chasms beneath the cement garage floor. Only flooding could route her out, and on many occasions I would find myself outside in the icy pouring rain to coax her out. On the occasion that the weather was particularly nasty, we’d put her in the garage with the luxury of heat—she didn’t like it, but she endured it. The dog loves cold weather. Due to her tunneling prowess, the evening dinner bell heralded a game. It was called, “Let’s hide the food bowl.” Ever try to reach blindly for a metal dish that’s either buried at the base of the hole or somewhere beyond human reach? Sissy would sit there not even attempting to hide her doggy grin as I tried to squeeze my human form into an opening made by a much smaller creature. Once pinned in an awkward position, in the dark reaching about, I was invariably gifted with a warm wet kiss as she tried to join me in that tight spot. Or, if it wasn’t a kiss, it was a goose at my rather upended position. There were those times that I became exasperated and dirty, when I would vehemently advise she bring the bowl back to me. Within the hour, the bowl would be at the gate. The game was over and dinner would be served. Each evening I was met with joy at our homecoming. Often Erin accompanied me with to feed Sissy; however, one night I was glad I was running late with Erin splashing away in the tub. Again it was warm weather, always a time of happenings. The security light on the post beside the garage illuminated my way as I carried Sissy’s dinner bounty to her. Unbeknownst to me, I had a little follower. Living in the country one must be watchful of these things. Sissy gave no sign or indication of our intruder until I unlatched the gate. I was still standing in the gate entrance when Sissy made her move. The term “greased lightning” doesn’t apply here because at least that can be seen. Sissy snaked between my legs I know, but I didn’t even have a chance to react. Whatever it was, Sissy had. Within nanoseconds, whatever it had been wasn’t anymore. I’d never considered my baby to be ferocious, but she was. Instinct placed me atop the doghouse as I began beseeching the dog to stop. I don’t know how I got there, but once in place I wasn’t about to be moved. Sissy paraded her prize by me and beyond the pen to the backyard. Throughout the ordeal, neither Sissy nor her victim had made a sound. It had been a silent death. I was the only one hollering there upon my perch out in the middle of nowhere, like a psycho rooster shrieking the announcement of the dawn, while hubby was safely ensconced in front of the tube and tot still splashing about in the tub. By then I knew what Sissy’s victim had been, by the wave of scent that washed over me. It was nearly as bad as being ambushed by a cosmetics sentry in the local mall. Call it a skunk, call it a polecat, it by no means was a rose. I was helpless to stop the tragedy and feared worse. I hopped down from the doghouse and ran over to the window at the living room to bring hubby running. It took us a while, but we finally corralled Sissy back into her pen. I made sure I was the only one to touch her. There was a reason for that too. The fear of rabies was running rampant and the last time I had the vet out to give her shots, Sissy had hidden in her tunnels refusing to be punctured. Remember, she knew and wasn’t stupid, only I was. Her rabies shots had lapsed and now both she and I were at risk. Later, when Erin was abed, hubby and I went inspecting. What was left wasn’t very definable, yet it was very small. Either adolescent or baby, the poor skunk wasn’t old enough to know any better. Apparently it had caught wind of the food I was bringing to my dog and thought it was a community banquet. The following day I did contact the humane society who came to retrieve and test the remains. Fortunately the poor little bugger didn’t have rabies and Sissy didn’t have to die and I didn’t have to undergo the tortuous treatments. However, Sissy was inoculated quickly thereafter. Stupid or no, I wasn’t about to endure that fear again. It wasn’t long after that Sissy got tired of her pen. Though large and spacious, she knows guilt when she feels it. 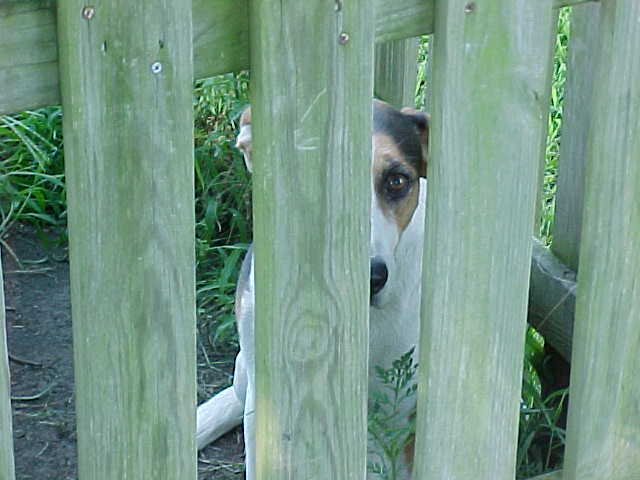 We would have much rather fenced the entire yard, but it was still beyond our budget. The yard is pretty large. Sissy took to escaping the pen by ripping holes through the steel mesh. And, hubby made his nightly repairs with reinforced wire only to have Sissy destroy it again within a few days. A familial conference was held. We invested what we could and came up with a great idea. Not a fencing in of the yard, but a furthering of the pen with a great play area. Sissy would now have more room to roam than we had in the house. Still it couldn’t contain the ever resourceful. It was the same year too, that we upgraded the house with an addition. New rooms and an expansive porch. She growled and barked at all the subcontractors, but she never laid a fang on them—thank God. Now, she’s taken up residence on the porch which we have plans to screen in later. Currently, we have no stray toms, they have vanished along with the local bunnies. Our snake population has been decimated along with every mole. The only birds she presents me with are starlings, she hates them, but leaves the others alone. Sissy never makes a sound when on the hunt. One foggy morning, as I was leaving for work and Erin was already on the school bus, I noticed Sissy nosing something about. It was a wild rabbit with half a haunch already missing. She glanced up at me in a guilty fashion as I removed the corpse to the farmer’s field with a handy shovel. However, nothing did remain when I arrived home but the “cotton-tail” of the deceased. It wasn’t my favorite way to begin the day. Upon observation, she knows to leave our neighbor’s tiny dog and cat alone because I found her stalking the cat. Sissy doesn’t growl at a fellow animal or charge, she stalks, much like a cat. She is a strange beast to be blessed with. She guards our parameter with gusto and gives us an outpouring of devotion when we arrive home. She somehow knows that biting people would be a very bad thing, so she barks savagely knowing we will salve her pride later. She has recently begun to shun commercial dog food. Sissy knows the difference between people food and dog food. She wants what we eat, or she eschews it. My baby is one reason that I cook in bulk over the weekends so that I may set aside portions for her dinner. If I present her with the most premium of dog food stuffs, I am met with a wounded stare and a still filled bowl the next day. And if you think I’m bad, hubby has made a bed on the porch and covers her up with an old blanket that Sissy gratefully accepts when the wind-chill is very low. Only an animal intruder will make her charge from the porch when she’s comfortably bundled up, and then, if it’s a male dog, he had better hide his three piece suit because Sissy has shredded a few. Every male dog in the area that wasn’t fixed by the vet, certainly is now in on form or another. Laundry is always best dried in the breezy country air. It took a while, but Sissy has learned not to retrieve clothes from the clothesline and use them as chew toys though my sweats still display her marks. I still cannot get her to avoid one of her avid interests, trash. The dog is a garbage hound that will strew the litter far and near, and then roll in it. God forbid someone has fish-clean leavings or dirty disposable diapers, for she will apply it as perfume. One must always approach with care. Sissy cavorts with Erin on her swing though runs and hides when a ball is introduced. She wants inside very much, but I know better. I am not ready for a bloody battle between house cat and dog. It wouldn’t be pretty. So, for now, Sissy has stamped her ownership on the new porch and won’t be usurped. It’s the closest she can be to us while we are indoors. Life with a dog is a great thing. They are ever eager, and their innocent joy should be what we discover every day too. A warm snuggle, a kiss, and a remonstration when necessary to keep us grounded, that’s life. It’s also the purest form of love.